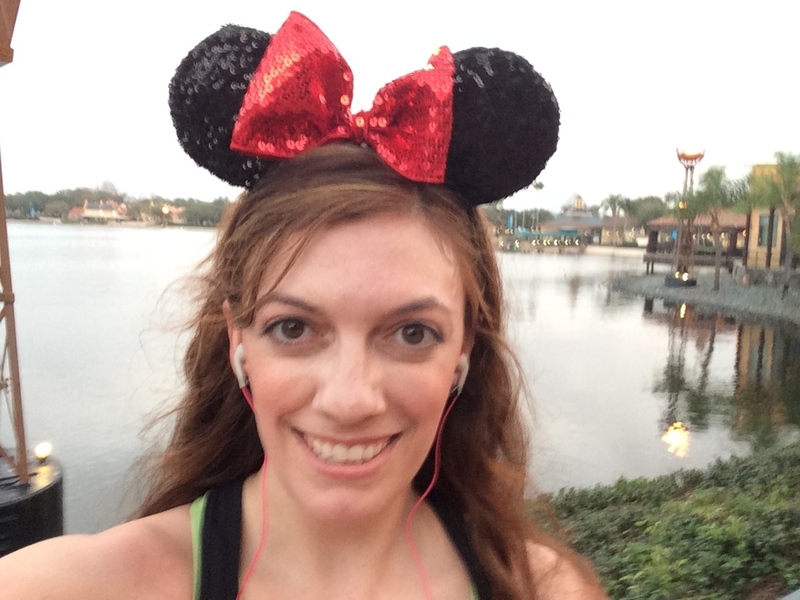 The morning of my first run at Disney World had come. I woke up a little earlier than I needed to, and headed over to the Pop Century to meet up with my friends and head on their bus to the 5K. Both my friend & I were decked out as Minnie, while my other friend (her mother) had decided to be Snow White. 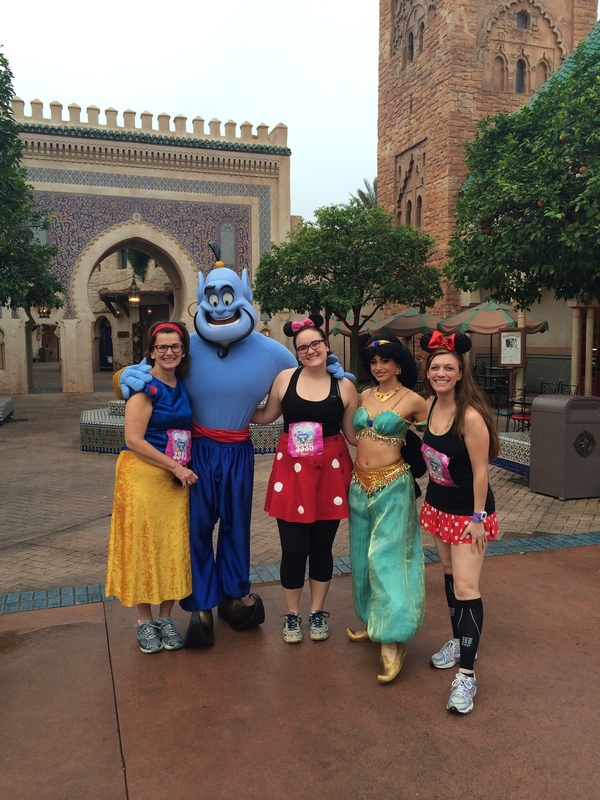 The setup for the 5K here was different than at Disneyland. Well, for one, it didn’t start in the Magic Kingdom. But, that point aside, you were actually corralled off. At Disneyland, they suggest you line up according to pace, but you are corralled by when you arrive, not by the letter Disney decides. For the 5K, I was in D and my friends were in B. I knew there would be a good 10 minutes difference between us. We waited outside the corrals for a little while; watching people dance to the music and viewing some of the awesome costumes as they passed us. Then, we said our goodbyes and I headed back to my lonesome in Corral D. I was planning to try to catch up to them. They were walking entirely and I was going to run a little. I made my way to where the corral would start off, the back corner, and sat down. We still had a good 30-40 minutes before the race started; and then I’d have another 20 before my corral would lead off. Once it was finally time to start, I was near the beginning and was able to get off with a good pace in front of a good portion of my corral (a good pace to me is about 12 minutes). It was slightly hot, but knowing I was trying to move through the first mile quickly, it didn’t seem to swelter too much. And the first mile through the parking lot, though not scenic, went by fast. The first character that runners came upon was Princess Atta from a Bug’s Life. I decided not to stop for her, though, and continued on and into Epcot. I snapped a lovely pic by the World Showcase and made my way to China where Mulan & Mushu were out. I saw my friends in line, too, so I had mostly caught up with them. I didn’t jump in line, though, and went to the end. Tangent rant, I don’t mind people jumping in line to take pictures with their friends, but it bugged me a bit when three people jumped in front of me to get in line with two of their friends and they all took individual pictures. A group shot, certainly would be good (they got one of those, too); but if your number of pictures increase then you are cutting. And that’s a big no-no. End Rant. It was in line I saw Patty of Margaritas, Miles and the Mouse pass & I shouted out to her & she waved. Celebrity sighting. Haha. :) The Disney community is so lovely. 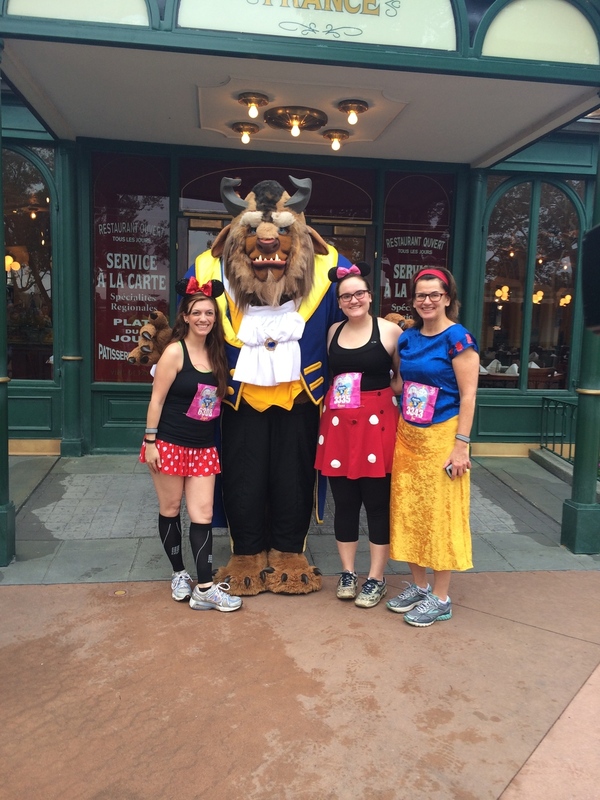 So, I took a picture with the lovely Mulan & Mushu and ran on. My friends were taking some pictures with the shrubbery, out for the nearing Flower and Garden Festival, so I did catch up by the time we made it to Morocco. The landscape set up for March was great – and I’m glad I’ll get to experience the festival when I come back in May. In Morocco, we waiting in line for Genie and Jasmine, then walked to the end of the line to get a picture with Beast (the two lines ended in the same place). The lines were rather long. About 5-10 minutes each. We took our good old time. I know they recommend a 16 minute pace for the 5K, but we finished WELL beyond that. I like that they extend the “family” run so I can get pictures and don’t have to worry about stopping on the longer runs when I might not be able to. 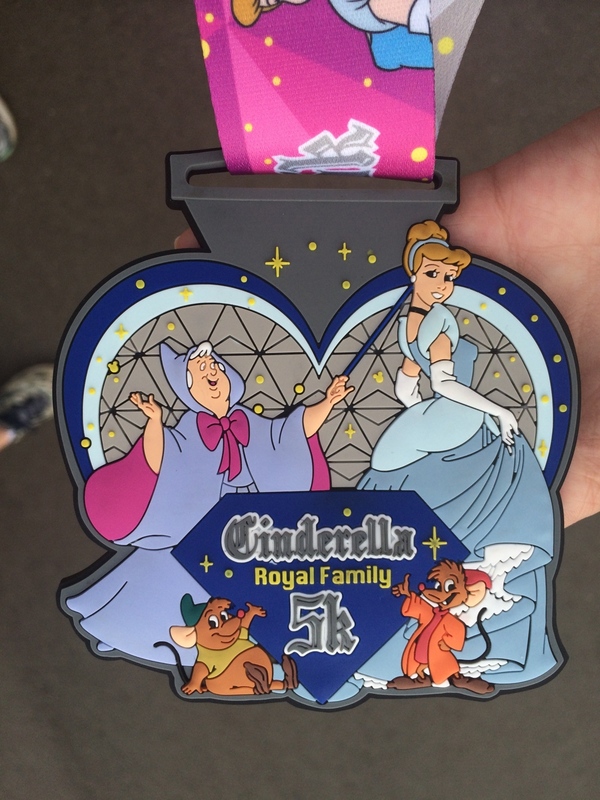 To the end we were finally, and we received our beautiful Cinderella & Fairy Godmother laden medals. Now this race was fun. I enjoyed myself. I actually do not have any cons. There were plenty of characters out. The first mile was in the parking lot, but not bad, and the remainder was pretty much in the park. Of course, I prefer the 5K course at Disneyland where you are running through more park (and two at that), but I did enjoy this run. Just going to point out my hair here. Curls at the beginning and a hot mess at the end. Haha. We mosied back on a bus and were back to our rooms rather quickly and ready for the day at Epcot. A post to come soon about that.